Please be sure to carry your PFD & fishing licences as NSW Maritime are out at Christmas time. Nsw fisheries inspectors are working the Snowy Mountains area during the peak holiday season. So remember if you do not have a current fishing licence and on your person you will be fined. So for the sake of 5 minutes do yourself a favour. A few pics of some of the many fish bagged in paradise. Most fish fell victim to a Royal Wolf with a black bead head dropper. It is a hard life waking in the morning to the sounds of Dingoes howling, clear sunny days and a stiff afternoon wind. Oh to be back. A few spinning anglers are coming up trumps on the river as well. The Celta in size 1 & 2 are still performing really well in brown trout and rainbow colour. Rapala lures in CD3 trout colours are still taking a few fish. Still no current Jindy fly reports.The lake has been fishing well when you can pick the days with good weather. But no reports have come in over the last weeks. Hi guy's,Hit the Lake Tuesday afternoon and scored this beaut 64cm fish on a weighted nymph. Fished Tooma, Tumut ponds ,Tangtangara and Blowering dam this week only tantangara and blowering doing any good ,caught only small trout at Tooma and Tumut ponds . Blowering dam was also good for reddies many double hook ups trolling and a few yellas most reddies around the 34cm mark with a few bigger ones, yellas up to 48cm . Another great week of fishing we had some nice cold days last week with a bit of snow falling one day but that did not stop the fishing. Trolling with the Eucumbene bomber is still doing the job but yellow wing Tassie’s are favourite’s and young John Cox caught a nice 4.25lb brown clean on a lofty cobra 100y. 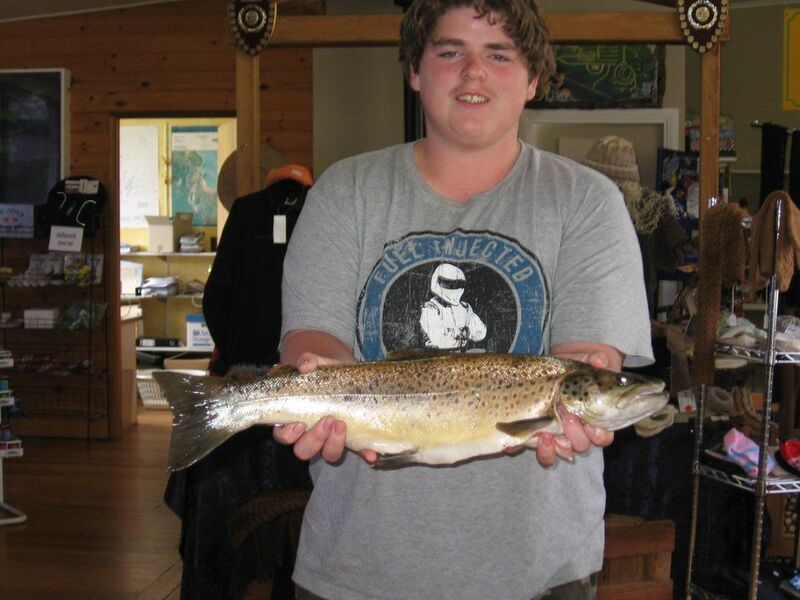 Here is Joyhn Cox with a healthy Brown Trout. Current Tassie s colours are Y48, PP, 36, Y36,Y62 81, Y82, 88, Y05, 48 ,YFR The Snowy Mountains minnows, Pm7, Pm8. Rapalas in floating and broken back are doing well in the following series,F7,F5, F9 in Rainbow trout, Brown trout. Spinning has been the best over the week and ghost blades with gold in them are exceptional everyone keeps saying how good the fishing is so come and visit us, with Australia Day coming up you could stay for a few days.